This creamy one pot chicken is made with no cream and packed with flavour! 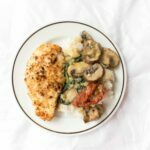 Made with a base of mushroom, spinach, and sun dried tomato, this creamy one pot chicken is the perfect recipe for a lazy dinner under an hour. In a shallow bowl or plate, combine the panko crumbs, parmesan cheese, salt and pepper. Coat the chicken breast with the mixture. Heat 1 tablespoon of the butter in a skillet. Fry the chicken until golden on each side, cooked through and no longer pink (about 5-6 minutes each side, depending on the thickness of the chicken. If you don't half yours like I did, you might need a longer cook time). Place aside on a plate. Put the rest of the butter in the pan and add in the onions, mushrooms, garlic, and spinach. Add in your sun dried tomatoes. Let the sauce to simmer for a further minute until cheese melts through the sauce and add the chicken back into the pan; sprinkle with the fresh herbs for garnish and serve over rice, pasta, quinoa, etc of your choice.